You just can’t lose when it comes to Tiramisu anything. Complete with lady fingers sponge cake soaked in kahlua and rum syrup to adorn the sides and vanilla sponge cake equally soaked for the base of this cheesecake. My vegan cheesecakes have always been a hit with vegans and non vegans alike, so if you are looking for a dessert to wow even your most carnivorous friends, THIS IS IT! Really easy recipe to make since my cheesecake is basically “throw it all in a food processor and then bake it” method! You will have to make the vanilla sponge cake of course, but I show you step by step how to do everything in the video below. For my lady fingers I did commission a special pan to get them exactly in the shape of the fingers, and the Wilton Delectovals pan is just perfect for this. You can of course forgo that entire part and make a more simple version of this cheesecake and it will still taste really great! But since the Tiramisu Cake is classically made with lady fingers I wanted to keep this one looking as authentic as possible! I also made my recipe of Buttercream with some vanilla and some flavored with mocha to decorate the top and also as “glue” to stick on those lady fingers. This is also optional but if you want it to look exactly like mine, you will have some extra steps to do, but it is so worth it! Oh yeah one more thing! I found some vegan wafer cookies and chocolate covered espresso beans for garnish too! 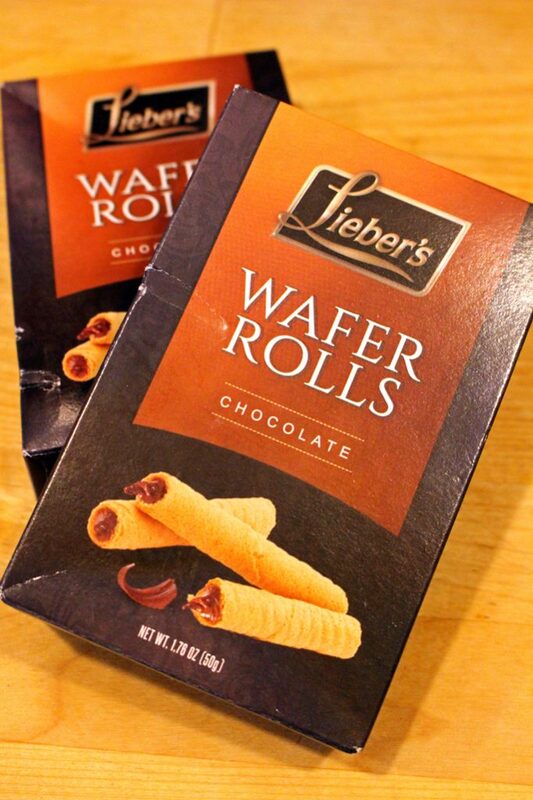 These things are often hard to find but I happened upon an accidental vegan treasure at my local Shop Rite with these chocolate wafer rolls! And they were only $1.69 a box! Add the last amount of flour and mix just to combine evenly. 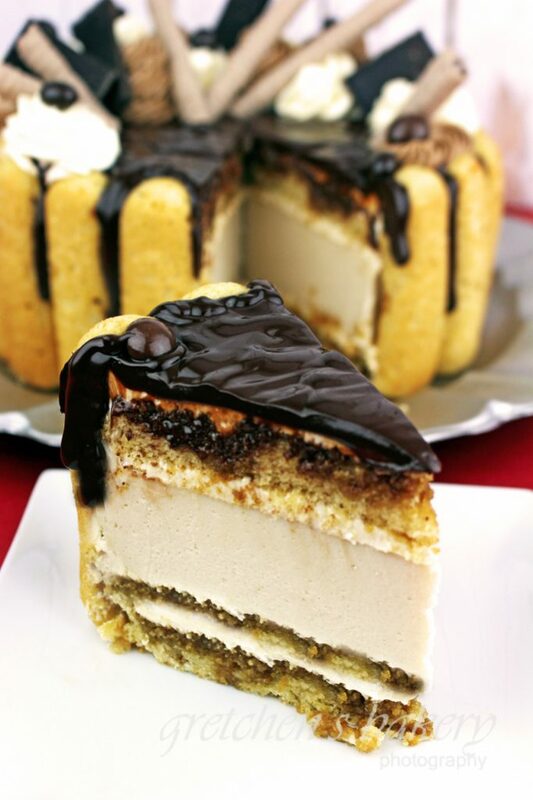 Next prepare the cheesecake batter by combining all the ingredients together in a food processor and process smooth. Bake in a greased and parchment paper lined 7" cake pan in a water bath for 1 hour at 350°F. After 1 hour turn the oven off but leave the cake inside to cool for another hour. Remove from the oven to cool completely then refrigerate overnight to set to firm. Prepare the tiramisu syrup by combining the sugar and water together in a small sauce pot and bring to a rolling boil. Remove from the heat and add the instant coffee granules and the rum & kahlua, cool to cold, refrigerate until needed. Prepare the buttercream of your choice and then the next day decorate as shown in the video. Hi Gretchen, I was thinking about buying your new book, but after reading an Amazon book review I’m wondering. A reviewer said that most of the recipes in the book need Ener-G egg replacer or Follow your heart vegan egg, I’m living in Brazil so importing these ingredients is not easy or affordable, Is it possible to substitute these for flax/chia eggs or aquafaba without compromising the final result. Thank you so much and best of all. Hi! thanks for getting in touch with me about this! I saw that review also, and while yes I do use that in many of the recipes, not all of them do. And there is a whole section on how to convert the egg replacers to flax, or chia or whetever! thanks!! Why did you change the recipe an insted of using tofu + cream cheese now you use just the cheese? Does it change the final product? Just curious. Love what you do, and inspire me. How would you rate the flavor of lactic acid powder versus apple cider vinegar? I have a new client who’s requesting a vegan cutting cake for her wedding. 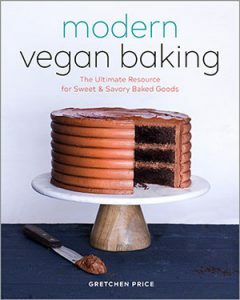 I’m goung to try your chocolate cake recipe but how do I make your vegan swiss buttercream chocolate? I couldn’t find any directions on your website. Thanks for the vegan recipes. I have a friend who can’t eat dairy or eggs so your recipes are a great help. However, this friend also is allergic to wheat so she needs gluten free recipes. 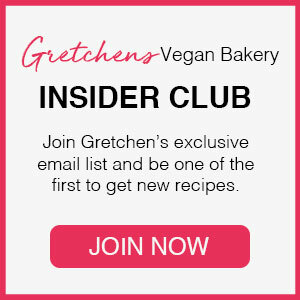 Can the glutin free flour be substituted I your recipes? Thanks for your help. Hi Thanks! I don’t do any gluten free baking, however I was told that when it is gluten free and vegan some other changes need to happen, so it’s not always a straight 1:1 substitution. I am lacto-vegetarian, so no eggs but dairy is fine. I feel quite excited about this recipe and was wondering if I can use regular cream cheese, milk and butter without changing anything else? Hi! This looks delicious and I can’t wait to try it out. I have a few questions about your execution. First, is that just a classic chocolate ganache you topped it with? Also, where did you use each of the buttercreams? Was the mocha just used for gluing the ladyfingers and the piping on top? I’m trying to improve my decorating and would love to recreate this as closely as possible. Thank you! The buttercream(s) are optional, but I used the one Kahlua one for a “glue” to stick the sponge cakes to the cheesecake and for glueing the lady fingers as well. The mocha was just for garnish (I added some ganache to the kahlua and got a luscious mocha kahlua frosting) you can use just one, not necessary to make both as I did, but since you’re going to have the buttercream made and the ganache too, its really easy to make them both from 1 recipe. Halloween Black and White Cookies in 30 minutes! Copyright © 2019 · Gretchen's Vegan Bakery. All Right Reserved.